The device uses state of the art transceiver design in CMOS technology to significantly reduce the total cost of ownership. It integrates a dual transceiver architecture to support 2×2 MIMO along with on-chip digital signal processing functions. The DSP combines with the on-chip analog filtering to enhance performance and eliminate – or substantially reduce – the need for external filters. Lime’s proven FPRF technology has been used by private companies, government and military organisations to create a myriad of wireless broadband technologies, from whitespace radios to disaster relief networks to communications infrastructure devices. The LMS7002M has a continuous operation spectrum of 100 kHz to 3.8 GHz, and is software configured to operate up to 120 MHz RF bandwidth. The device can be configured to use the 2G, 3G and 4G standards – including all TDD / FDD variants – and a host of additional standards, including WiFi. To enable advanced networks to be created, the chip features a dual transceiver architecture. 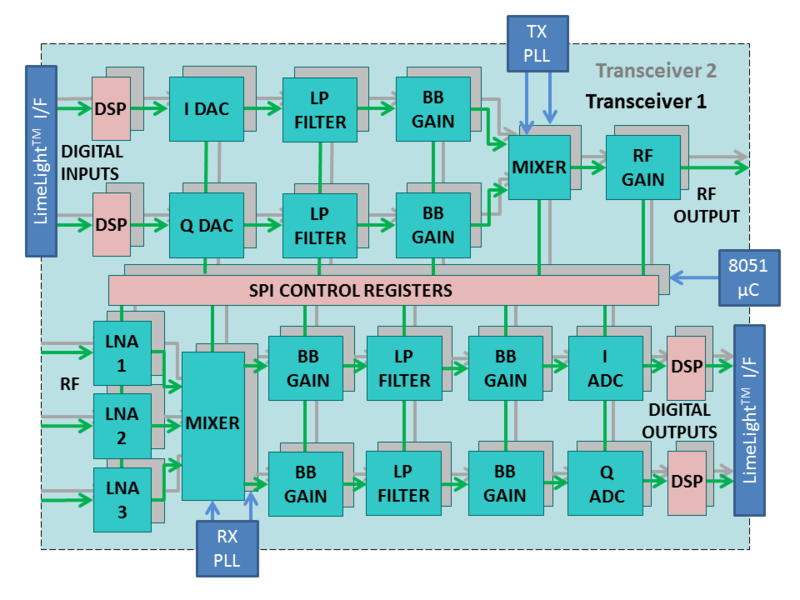 It integrates 12-bit ADCs and DACs, LNAs, filters and mixers to provide two transmit and receive paths, enabling a true single-chip (2×2) MIMO operation. The transceiver’s enhanced capability features, such as an on-chip microcontroller, further simplify its calibration and installation. Furthermore, its extensive on-chip DSP has been programmed to enhance functionality and performance. Multiple devices can be used for higher order MIMO configurations. The device is fabricated using a low cost CMOS process and has been designed for the lowest possible power consumption. The DSP supplements the analogue gain with digital control and is an important factor in reducing the overall power consumption. This allows the LMS7002M to operate from a single supply rail of 1.8V with individual blocks capable of being powered down for further power savings. The LMS7002M has a standard serial port interface (SPI) for programming and includes provision for a full RF calibration. The device combines LNA, PA driver, RX/TX mixers, RX/TX filters, synthesizers, RX gain control, and TX power control with very few external components. The chip is programmed by a serial bit stream and is designed using an open source configuration tool suite. The GUI provides access to all the parameters in each block. Designers can accept the defaults or change the control settings that are downloaded to the devices to meet their system requirements. The LMS7002M is packaged in a 11.5 x 11.5mm aQFN 261-pin package. It is available with the Universal Wireless Communications Toolkit (UWCT), which includes an evaluation board and associated software. The LMS7002M FPRF transceiver can be used as a software-configured, fully-functional MIMO transceiver or to replace discrete ADC, DAC, DDS (direct digital synthesizer), AGC or RSSI (received signal strength indicator) devices. It has been priced aggressively to compete with these discrete components, allowing it to replace several individual chips. Lime supplies free software comprising an intuitive GUI and open source solutions to speed the device design-in process. The single chip transceiver requires only a few low cost external components, and customers can access Gerber files to significantly reduce the PCB layout time. In addition, the on-chip microcontroller simplifies the calibration and alignment costs during the manufacturing process. These all contribute to minimize your total cost of ownership.